Home What Are The Common Types Of Sports Betting? What Are The Common Types Of Sports Betting? Sports betting is a term that refers to the activity of placing wagers by predicting the outcomes of sports events. The history of this betting type is quite old and it has evolved a lot over the years. Now, there are a number of types of bets that you can place on different types of events. There are several sports out there and the type of betting varies greatly depending on which sports you are following. Whether you are a newbie sports bettor or have been betting on sports for a few years, you can benefit by knowing the different types of sports betting, which we are going to discuss here. This is the most common and the traditional betting method for sports. This is also one of the simplest. The term “fixed odds” means that the odds on a particular bet are decided and agreed by both parties at the time when the wagers are made. The wins are paid out at these fixed odds, even if the odds change during or by the end of the game. This type of sports betting is straightforward, where you wager simply to back a sports event. You can place a wager on whether a team will win a match, or if a player will win a tournament. If your player or team wins, you win the bet and get paid out. This is a special type of sports betting in which instead of placing wagers against a bookmaker, you play directly against other bettors. There is no bookmaker involved here, only the exchange market. The wagers you can place on an exchange bet are almost the same as in normal betting and you also get fixed odds at the time of placing the wagers. Since there is no bookmaker involved, you act as a bookmaker when you bet against other players and vice versa. All wagers are made by bettors and with other bettors. There are two sets of odds in this type of betting – lay and back. If you wager on backing a team on the given odds, you will be betting with someone who has already wagered on laying the same team. It means the other person would be backing that team to lose whereas you will back it to win. As the name suggests, this type of betting allows you to bet on an event after it has started. It is a form of fixed odds betting. Whereas in traditional betting, all wagers must be placed before the event starts, live betting allows you to place wagers any time during the event, even in the last minute of the game. The internet plays a major role in live sports betting, as the bettors get to see live events and bet in an ongoing match right from the online sportsbook. The timing is a very crucial factor in live bets. This is the main reason why this service is only offered by online sports gambling sites, as of now. The in-play bets are made on the odds available at the particular time in the event. Some of the common examples of this type of betting are – wagering on which player will score next, or wagering on which team will get a yellow/red card next. In this type of betting, instead of wagering on the fixed odds, you get to wager on a spread or a range of odds. This is somewhat similar to over/under betting, also known as totals betting, where you make wagers by predicting whether the total runs/goals/points scored in a match will be higher or lower than the amount set by the bookmaker. Whereas totals betting pays you simply based on whether your prediction on an event is right or wrong, spread betting is a little more complex. In this type of sports betting, you wager on a spread of points and the wagers are settled depending on how much you are right or wrong by. For example, if a spread market shows you two numbers – 193 and 195 – for total points in a basketball match, that means you can either buy the spread (back the over) at 195, or sell (back the under) at 193. You also need to decide how much wager you want to stake per unit. Now, if you buy the above spread at 195 for $5, it means that you are backing the team to score over 195 points. If your team scores, let’s say, 199 points, you win the spread by 4 points, and therefore, you will be paid 4×10 = $40. It is one of the oldest types of sports betting that is still practised today. This is also a type of betting where you do not need a bookmaker. The main reason for the invention of this betting type was to find a way to avoid paying the profit margins (commissions) to bookmakers on a bet. Instead of simply wagering on given odds, all the wagers placed by everyone on that particular event are combined in a pool and the winnings are distributed accordingly. There are no odds in this type of betting. Let’s understand this with an example. Suppose that 10 bettors wager $5 each on the win of Team A in a soccer game and 10 other bettors wager $5 each on the win of Team B. The total wagered money, $100 in this case, would go to the betting pool. Now, if the team A wins, the $100 would be distributed among the 10 bettors who backed Team A to win. So, each player gets $10. Electronic sports have become quite popular in the recent years. The history of video games goes back to the 1970s, and since then, this industry has seen tremendous growth, mostly thanks to the internet. Many gaming companies and websites organize professional video gaming competitions and even accept wagers on the outcomes. The same goes for professional online gaming where you can bet real money and win while playing your favourite games. Online casinos are an example of this. If you were looking for the different types of sports bets, here you go. 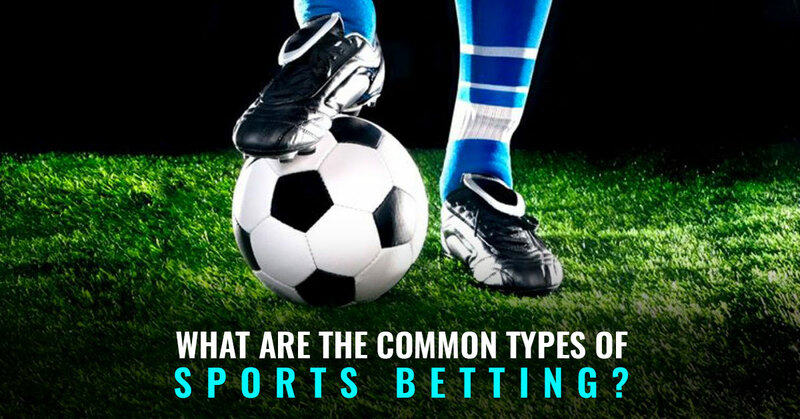 Following are the most common types of sports bets. Sports betting is probably the most popular of all betting methods. It gives you a chance to earn money while enjoying your favourite sports.